Depleted uranium (DU) particles and DU oxides are present at military test and training ranges in the southwestern United States (U.S.) because of its use in military munitions and for armored shielding. Also, since approximately 1990, DU particles and DU oxides also occur in similar arid region military theatres throughout the world. At a study area in the northern Mojave Desert in the U.S., soil sampling and ground and aerial gamma-ray screening had suggested that DU particles and DU oxides had not migrated by surface water transport significant distances from their original location near a target area. However, no predictive models had been developed to forecast how far the particles would move with time. A flow and transport model was developed using the FLO-2D model to study the unconfined flow conditions over the complex alluvial fan topography in the study area watershed. The Zeller-Fullerton sediment transport equation was selected because of its ability to model sediment transport when a substantial portion is expected to be by bedload, an assumption warranted because of the density of DU and DU oxides (19.20 and 4.80 g/cm3, respectively). Modeling results indicate that a local 100-year storm could cause transport of both DU particles and DU oxides, primarily along well-defined channels, although transport could occur across alluvial surfaces as well. However, the transport distance of DU particles and DU oxides was limited to approximately 120 and 150 m, respectively. 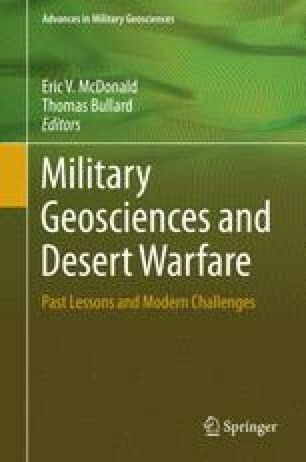 The modeling approach used in this study could be used as a predictive tool for transport on military testing ranges to address environmental compliance issues and protect military personnel during training exercises from potential unnecessary exposure by better delineating the eventual area where DU particles and DU oxides may occur. The predictive modeling also could be applied in military theatres where DU munitions were used to better understand the dispersal of DU particles and DU oxides over time by fluvial transport to help protect military and civilian populations from coming in contact with the high density metals.